Preferred Living is bringing an intimate apartment community rich with amenities to Dublin with the opening of our newest community, Greydon House. 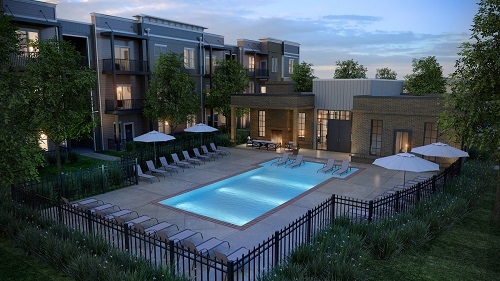 Located in the thriving Tuttle area of Dublin on the Northwest side of Columbus, Greydon House offers the luxurious amenities you’re looking for in an active lifestyle-centered apartment community. Its prime location at 5284 Avery Road is in the middle of everything the Columbus area has to offer: golf courses, parks, shopping, restaurants and an active nightlife scene. Direct access to regional highways puts you within minutes of it all. Unwind at the tranquil pool and expansive sunbathing deck, work out in the fitness center, get caffeinated at the complimentary Starbucks coffee bar, prepare a meal at the outdoor kitchen with gas grill or walk your dog around the community’s tastefully manicured grounds – pets are always welcome here. Greydon House’s modern, luxury-laden suites feature a gourmet kitchen complete with latte-stained cabinetry, tile backsplash, granite countertops, built-in microwave and stainless steel appliances. Every unit also includes nine-foot ceilings, large walk-in closets, plush carpeting, brushed nickel fixtures, and a washer and dryer. Suites with a private patio or balcony are also available. You’ll enjoy living in Greydon House’s smaller, more intimate setting that offers the best of Dublin, complete with concierge-like services you expect from a Preferred Living community. We offer onsite maintenance and management, while our online Resident Connection lets you make rent payments, place maintenance requests and check our events calendar with ease online. Contact us today to learn more about making Greydon House your new home in Dublin. You can also look for Preferred Living and Greydon House on Facebook and Instagram to stay connected with all of the latest news and events in the community.